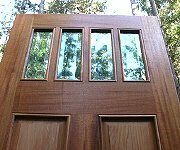 Here is an opportunity for you to view the construction of a Mahogany Entry with Sidelights and 2 other Mahogany doors for a home in Connecticut. machining layout and fitting glued up " dry fit "
Most of our exceptional fabricated glass products have been constructed by Thermal Sun Glass of Santa Rosa, CA 3 doors ~ 2 sidelights double wide Off to town ! !